In Brief: This mellow but exquisitely constructed prelude to Resurrection Letters, Part 1 might actually be superior to its parent project. This is a nice little meditative morsel, ideal for Ash Wednesday or Good Friday, or any time the listener wants to reflect on the meaning of Christ’s death on the cross. 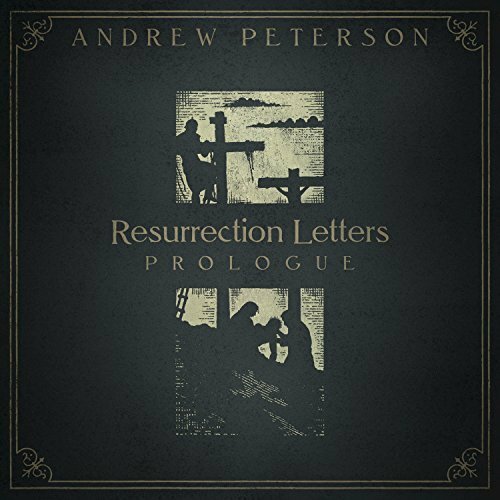 It’s been 10 long years since Andrew Peterson released his album Resurrection Letters, Part 2. Its companion album, Resurrection Letters, Part 1, was always meant to come later, even though Peterson had told the later part of the story first. But even when his plan was announced to finally finish in 2018 what he had started in 2008, I didn’t expect that we’d get yet another set of songs to tide us over in the months leading up to Part 1‘s release. In trying to explore the significance of Christ’s resurrection, Peterson felt it important to first release a small set of songs reflecting on the significance of Christ’s death, and apparently he considered both the crucifixion and resurrection too much for a single album, so the EP Resurrection Letters: Prologue was born. Throughout these five tracks, Peterson sticks to the mellower, more piano-driven and arrangement-heavy side of his folk/pop sound, leaving the up-tempo anthems and hammer dulcimer and all that good stuff for the main event. The surprising result, even though this is a more somber set of songs, is that I actually find myself drawn to this EP more than its companion album. Even though there are only really four songs and a brief instrumental interlude here, he really knocked it out of the park in terms of the mood he wanted to convey, the events as told in the Bible that he wanted each song to cover, and the intriguing perspective from which he approaches each chapter in the story. I might have actually preferred for all 14 tracks from the EP and LP combined to just be on one big, long album, as I think it would have made Part 1 stronger overall, but I don’t get to decide these things, so I’m just going to tackle Prologue here as a separate review, and then cover the nine songs heard on the actual album in my next review. This first track is one of the most striking pieces of music I’ve ever heard from Andrew Peterson. It’s also one of the most repetitive. There’s a reason for that, of course – instead of following the usual verse/chorus song structure, this song simply repeats the last seven phrases uttered by Jesus on the cross, beginning with “Father, forgive them, for they know not what they do”, and ending with “It is finished”. Peterson has multi-tracked himself here so that each of these seven vocal parts gradually appears and then disappears – he’s essentially singing with himself in a round. The melody may be repetitive, since once each of those parts appears, it remains the same until it drops off as the song winds down at the end. But the way that the layers build up, from a bare voice at the beginning and end, and intertwining around the simple drum loop and piano melody in between, makes it a work of subtle genius. This establishes an appropriately liturgical mood for Prologue‘s entire song cycle. As with most of the EP, this track is a slower, piano-based song – due to Peterson’s folksy beginnings, I still think of him as primarily an acoustic guitar-based musician, but he’s proven surprisingly adept at constructing gorgeous songs around the piano, including some personal favorites of mine such as “The Magic Hour”, “The Voice of Jesus”, and “The Rain Keeps Falling”. This one’s a bit of an experiment for Peterson, taking its sweet time to unfold at just shy of six minutes long – though in light of the ten-minute “Don’t You Want to Thank Someone” from Light for the Lost Boy, it’s really not that much of a stretch, nor is it at all a chore to listen to. The sound of the piano has a bit of reverb on it, as if it’s being played in a big, empty room very early in the morning, and I love the atmosphere that it sets up for a song that meditates on the decision God made to sacrifice his own Son for the sake of humanity, and how Christ was able to endure the pain and suffering “for the joy set before him”. The central idea behind the song is that Christ is the only one worthy of hearing those words, “Well done, my good and faithful servant” – none of the good any of us can do even holds a candle to it. I love how effortlessly Peterson is able to blend his usual storytelling style with clear-cut Biblical references – he’s finding a way to take a story Christians have heard a million times by now, and to put us in the middle of the experience in a way that feels unique to him as an artist. This song is never flashy, but the way that he works in the drums, acoustic guitar, chimes, backing vocals and so forth shows that he’s got a real ear for the details. It’s a song that fully immerses the listener without ever stooping to cloying melodrama to get its point across. This instrumental track is the only one on the EP that doesn’t have a “Story Behind the Song” article up on Peterson’s “The Rabbit Room” blog, plus it’s an instrumental, so I can only make an educated guess after a bit of Googling that it’s about the liturgical practice of stopping to pray at certain hours of the day – in this case, the “Nones”, or the hour we modern folks know as 3 PM. This two-minute piece features the piano and a string section, and while the piano melody is lovely, it doesn’t really have enough time to draw much attention to itself, so it’s really more of a palette cleanser between a pair of emotionally heavy songs. This is the one track where the acoustic guitar takes prominence – and it’s a delicately finger-picked song in 6/8 time that finds Peterson in a very vulnerable place, so of course I’m going to take notice, because some of his very best songs have been borne out of such experiences. The story behind this one is especially heavy – a friend of his quite suddenly lost his wife in childbirth, and “God is always good” was the mantra his friend used to help get through the grief. Peterson wrote and performed this song for the funeral, and while on the surface it affirms a simple truth, it’s also honest about the fact that we often don’t understand what God is doing or how there is evidence of God being good in the midst of what, to us, looks like a pointless tragedy. Peterson relates this feeling to how the disciples must have felt in the darkest hour when their leader – the one they had held out hope would be their Messiah – lay dead in a tomb for an entire weekend, seemingly proving that they’d bet their entire lives on a fraud. For most of us who have lost loved ones, the miracle of resurrection doesn’t come after three days, obviously, so there are limits to this analogy. But I think the crux of this song is that we often have to find faith that God’s intentions are good, to believe what we cannot yet see, even when it feels like we’ve been left to the ravages of a cold, dark, and random universe. In that sense, it’s similar to the very real expressions of faith amidst doubt that were heard on Steven Curtis Chapman‘s Beauty Will Rise in the wake of his young daughter’s death a decade ago. It’s a standout song for Peterson, borne from circumstances that I wish never had to take place, but a soothing reminder of God’s sovereignty nonetheless. In this final track, which brings us back to the peaceful “piano in an empty house in the early morning” feel of track two, attempts to imagine how the disciples must have felt as they laid Christ’s body to rest in the tomb, their hopes essentially being buried with him over that long weekend until he rose from the dead. Peterson’s lyricism is in top form here: “The sky was red as blood along the blade of night” aptly describes the mood of hope rapidly dimming on that dark evening, and it provides an interesting bit of symmetry with the title of his previous album, The Burning Edge of Dawn. He makes an interesting analogy between creation and resurrection here, noting that God rested on the very first Sabbath, and rested once again on that long, painful, silent Saturday between what Christians now know as Good Friday and Easter Sunday. Peterson had taken a trip to Jerusalem while he was writing the album, and this song was inspired by the striking stillness of a holy city on a day many of its inhabitants observe as a God-ordained day of rest. Musically, this one doesn’t feel quite as complete and satisfying to me as the other tracks on the album, but I think it isn’t meant to – it’s a pause, a “to be continued” message of sorts, a time to put a bookmark between chapters and take a few moments to reflect in the silence. Joy will come in the morning – but at this point in the story, we don’t know it yet, and our weary souls just need a breather.